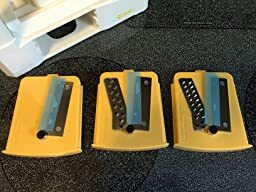 This is a really good idea and although this doesn’t take up a lot of counter “real estate” it manages to allow you to keep the 3 blades inside it so you don’t lose them. It doesn’t weigh too much but is substantive enough to not jump around too much when using it. 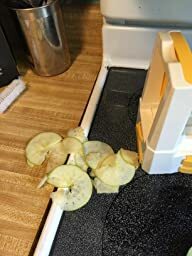 The pictures you see are of a green apple as I tested it by cutting one up. If you have a dehydrator, it would be awesome to use this cut to make kid snacks. 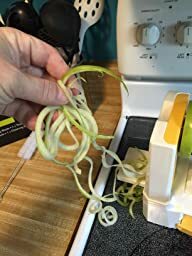 The handle is easy to turn and there is a clever placement of a handle to allow you to push the fruit/vegetable forward. The holder is great! It is sharp enough plastic to allow the apple to be skewered but not cut me. There is a retractable suction cup on the bottom to help it stay in one place. It works well! If this 30-something year old father of 3 can use it, anyone can in my opinion as I’m not the most culinary inclined. 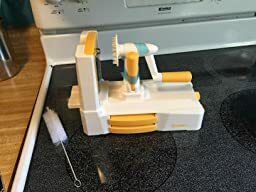 This doesn’t feel cheap, it feels like it will last a while and it is VERY easy to clean! I was able to clean it out in about 3 minutes (and that was because I took my time and care with the blades I used). The only con that I can can think of is that it could be a bit easy to move around if you don’t take care but it has blades so it would be a bit foolish to be in a hurry. It is convenient but also sharp (which is absolutely required). They seemed to have thought of everything in this design! I’m looking forward to making some home made chips!